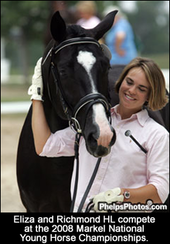 Eliza specializes in working with young dressage horses. She very much enjoys the whole process - from basic ground work, to lungeing, to backing, to competing in the FEI Young Horse classes. Eliza has started close to 50 horses under saddle in the last 10 years. She learned about backing youngsters by working with her mother, Cindy Sydnor, who would occasionally start young horses. Eliza always enjoyed the process and gradually found that she had a special talent for keeping the young horses calm and happy, and explaining the aids to them so that they easily understood. For the past ten years, Eliza has worked closely with Scott Hassler, who was the US Young Horse Coach for many years. Scott has helped Eliza primarily with her two horses, Gracie and Lancer, both of whom she started under saddle and developed into competitive FEI horses. Scott has also seen Eliza on many other youngsters that she started and has always been impressed with her ability to get them on the right path from the very beginning without pressure or force. Eliza was one of the original trainers selected for the first Young Dressage Horse Trainers Symposium, that Scott puts on each year at his fabulous facility. She has been invited every year and has also been chosen as a demo rider three times. Eliza is a firm believer in the classical method of dressage, and the correct starting of young horses. If time is taken and the trainer has good skill, starting a young horse under saddle does not need to be a dangerous or scary thing. Correct handling on the ground, followed by correct lungeing, followed by correct riding, creates a happy horse who understands his/her job in a fairly short span of time. Eliza has qualified 5 young horses for the National Championships. In 2008, Eliza competed Richmond HL in the National Young Horse Championships to an overall 5th place finish in the U.S. Eliza has also prepared other young horses for the FEI Young Horse classes, and enjoys the program very much. Another specialty of Eliza’s is preparing young mares for the Mare Performance Test, both for Hanoverians and Oldenburgs. Eliza has taken seven mares through the MPT, most of whom she started under saddle, and four won their tests with very high scores. The American Hanoverian Society has recognized Eliza through their Trainer Identification Program as one of the best in the country for starting horses under saddle and competing in dressage from Training level through FEI. Horses are worked 5 days a week, with a mix of lungeing, riding and hacking out all over our 500+ acre farm. In addition to dressage work in the arena, the young horses learn to hack out happily, first with other horses and eventually on their own - through streams, past cows, up and down hills, etc. If your horse is in training with Eliza, she will compete him or her at no extra cost. If the owner cannot come to watch the training, a weekly progress report will be emailed and monthly photographs and videos sent. Eliza also has extensive experience teaching young horses to free jump. We have a few farms in the area with a perfect set up for free jumping, and this is a part of every young horse's training. Short field trips off the farm ensure your young horse understand loading and unloading in a trailer, calmly working in a new environment, and then coming home to relax again. There is no set amount of time that Eliza takes to start a young horse under saddle, since every horse is treated as an individual. But she does request a minimum of 3 months of training to get a horse started well.